Anti-racist convoy demonstration 1 September 2013 is just one of the events taking place this month, read more in the upcoming events section. Join IHRC and Sandew Hira in London or Birmingham this September. Following the success of last year’s course, IHRC is delighted to be holding more Decolonising the Mind courses led by Sandew Hira from the International Institute for Scientific Research in the Netherlands. As well as the Visionary Exhibition Launch and Author evening with Joe Glenton. In the UK, the case of the Butcher of Gujarat, Narendra Modi, has reared its head again, with an invitation being extended to him to come to the UK. Below we link to our report from 2003 on the horrors of the 2002 massacres. Protest against invitation to Narendra Modi more information below in the upcoming events section. 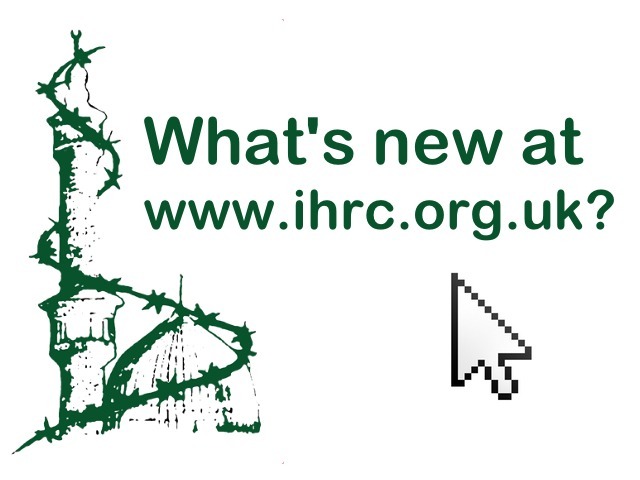 Don’t forget you can follow us on Facebook, Twitter @ihrc or on Youtube. Monday 26 of August, around 7 pm, Aissatou N. threw herself out the window from the 4th floor of her family’s apartment. She is currently hospitalized in the parisian region. Fortunately, and despite of what a few media reported, the vital prognosis is not engaged. IHRC believes that the use of chemical weapons is abhorrent and vile. IHRC has argues and continues to that, as with nuclear weapons and other weapons of mass destruction, that chemical weapons are a genocidal tool. This is something we have undertaken much work on and forms part of the basis of Genocide Memorial Day (www.genocidememorialday.org) , and annual event organised by IHRC, which inter alia commemorates such heinous attacks as the killings in Halabja in 1988 by the regime of Saddam Hussein. Press TV has talked with Massoud Shadjareh, head of the Islamic Human Rights Commission in London, to shed more light on the issue of massive spying operations on mosques and secretly earmarking them as terrorist organizations by the New York Police Department. IHRC chairman, Massoud Shadjareh speaks to Press TV about the Syrian conflict and child refugees. Press TV has conducted an interview with Massoud Shadjareh, head of the Islamic Human Rights Commission, about the United Nations Children’s Fund (UNICEF) saying the number of child refugees who have fled the turmoil in Syria has reached one million. Activists will be holding a rally on Sunday against the racist vans. British activists are to take part in an anti-racist convoy of vans, cars, bikes, mopeds and other vehicles across London in opposition to the UK government’s racist vans. British activists will be protesting against G4S wrongdoings in Palestine. British activists are to demonstrate outside the London headquarter of private security company, G4S, over its role in the illegal detention and torture of Palestinian teenagers in the Israeli regime’s prisons. Departing Tower Hamlets and travelling through London. IHRC is delighted to host visionary photographer and artist Nasreen Shaikh Jamal al-Lail’s work at its gallery in Wembley, northwest London. Jamal al-Lail is a First class graduate in Photography (BA) from the University of Westminster. Join IHRC and Sandew Hira in London or Birmingham this September. Following the success of last year’s course, IHRC is delighted to be holding more Decolonising the Mind courses led by Sandew Hira from the International Institute for Scientific Research in the Netherlands. We have some new titles in African American History. A superbly detailed documentation of the presence of Africans in ancient America. We see clearly the unmistakable face and hand print of black Africans in pre-Columbian America, and their overwhelming impact on the civilizations they encountered.